Through song, story and music, ‘Nearly All Irish’ show brings to the stage the traditional and contemporary themes and rhythms of Ireland’s rich culture. From a land that has touched the hearts of millions across the globe comes a show that has grown out of the experience of two Irish emigrants moving to Australia and an Australian born and bred who has fallen in love with Ireland. Bringing together different interpretations and insights in to a land 10,000 miles away, this is a show that captures the heart of Ireland by depicting it in the midst of the vast landscape of Australia. Three well seasoned musicians capture in music, song and story the beautiful and mystical magic of a country that has sent a message across the world of a unique land full of mystery, legends, music and verse. Songs and stories portraying Ireland quintessence – from emigration to the madness, the drink to the fairies – this show will take you on a journey into the heartland of a contemporary and traditional Irish culture. 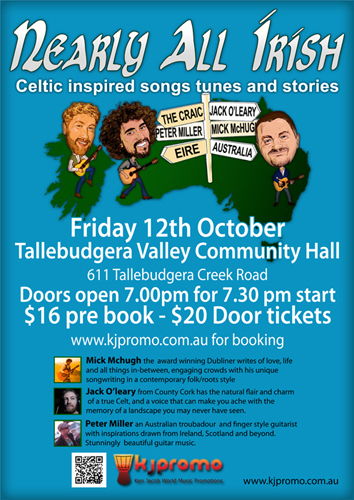 The three musicians, Jack O’Leary from Cork, Mick McHugh from Dublin and Peter Miller from the Gold Coast are excited to bring to you this unique show combining each of their personal Emerald Isle stories and music to give their audiences an authentic Irish experience. Between them, they boast a wealth of talent and expertise. Together they deliver an unforgettable entertainment experience with an authentic Irish flavour. Through song, story, music and verse, ‘Nearly All Irish’ brings to the stage the traditional themes and rhythms of Ireland’s rich culture. 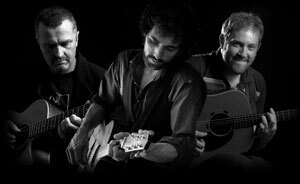 Featuring soaring vocals, award winning songs, exciting and magical moments on guitar – this dynamic trio is known to move audiences to tears, to sing along and of course they never fail to invoke the lilt of Irish laughter along the way – a sure crowd pleaser. Whether you are of Irish ancestry, love the Irish brogue, or just love a great night of music and craic – don’t miss this one of a kind show.